Fentanyl transdermal system contains a high concentration of a potent Schedule II opioid agonist, fentanyl. Schedule II opioid substances which include fentanyl, hydromorphone, methadone, morphine, oxycodone, and oxymorphone have the highest potential for abuse and associated risk of fatal overdose due to respiratory depression. Fentanyl can be abused and is subject to criminal diversion. The high content of fentanyl in the systems (fentanyl transdermal system) may be a particular target for abuse and diversion. Fentanyl transdermal system should ONLY be used in patients who are already receiving opioid therapy, who have demonstrated opioid tolerance, and who require a total daily dose at least equivalent to fentanyl transdermal system 25 mcg/hr. Patients who are considered opioid-tolerant are those who have been taking, for a week or longer, at least 60 mg of morphine daily, or at least 30 mg of oral oxycodone daily, or at least 8 mg of oral hydromorphone daily or an equianalgesic dose of another opioid. Since the peak fentanyl concentrations generally occur between 20 and 72 hours of treatment, prescribers should be aware that serious or life threatening hypoventilation may occur, even in opioid-tolerant patients, during the initial application period. The concomitant use of fentanyl transdermal system with all cytochrome P450 3A4 inhibitors(such as ritonavir, ketoconazole, itraconazole, troleandomycin, clarithromycin, nelfinavir, nefazodone, amiodarone, amprenavir, aprepitant, diltiazem, erythromycin, fluconazole, fosamprenavir, grapefruit juice, and verapamil) may result in an increase in fentanyl plasma concentrations, which could increase or prolong adverse drug effects and may cause potentially fatal respiratory depression. Patients receiving fentanyl transdermal system and any CYP3A4 inhibitor should be carefully monitored for an extended period of time and dosage adjustments should be made if warranted (see CLINICAL PHARMACOLOGY - Drug Interactions, WARNINGS, PRECAUTIONS and DOSAGE AND ADMINISTRATION for further information). The safety of fentanyl transdermal system has not been established in children under 2 years of age. Fentanyl transdermal system should be administered to children only if they are opioid-tolerant and 2 years of age or older (see PRECAUTIONS - Pediatric Use). Fentanyl transdermal system is ONLY for use in patients who are already tolerant to opioid therapy of comparable potency. Use in non-opioid tolerant patients may lead to fatal respiratory depression. Overestimating the fentanyl transdermal system dose when converting patients from another opioid medication can result in fatal overdose with the first dose (see DOSAGE AND ADMINISTRATION - Initial Fentanyl Transdermal System Dose Selection). Due to the mean half-life of approximately 20 to 27 hours, patients who are thought to have had a serious adverse event, including overdose, will require monitoring and treatment for at least 24 hours. Fentanyl transdermal system is intended for transdermal use (on intact skin) only. Do not use a fentanyl transdermal system if the pouch seal is broken or the system is cut, damaged, or changed in any way. The amount of fentanyl released from each system per hour is proportional to the surface area (25 mcg/hr per 19 cm2). The composition per unit area of all system sizes is identical. 1) a backing layer of polyethylene/polyester film; and 2) a drug-in-adhesive layer. Before use, a protective liner covering the adhesive layer is removed and discarded. The active component of the system is fentanyl. The remaining components are pharmacologically inactive. Fentanyl is an opioid analgesic. Fentanyl interacts predominately with the opioid mu-receptor. These mu-binding sites are discretely distributed in the human brain, spinal cord, and other tissues. In clinical settings, fentanyl exerts its principal pharmacologic effects on the central nervous system. Fentanyl transdermal system is a drug-in-adhesive matrix designed formulation. Fentanyl is released from the matrix at a nearly constant amount per unit time. The concentration gradient existing between the adhesive matrix and the lower concentration in the skin drives drug release. Fentanyl moves in the direction of the lower concentration at a rate determined by the matrix and the diffusion of fentanyl through the skin layers. While the actual rate of fentanyl delivery to the skin varies over the 72-hour application period, each system is labeled with a nominal flux which represents the average amount of drug delivered to the systemic circulation per hour across average skin. While there is variation in dose delivered among patients, the nominal flux of the systems (25, 50, 75, and 100 mcg of fentanyl per hour) is sufficiently accurate as to allow individual titration of dosage for a given patient. Following fentanyl transdermal system application, the skin under the system absorbs fentanyl, and a depot of fentanyl concentrates in the upper skin layers. Fentanyl then becomes available to the systemic circulation. 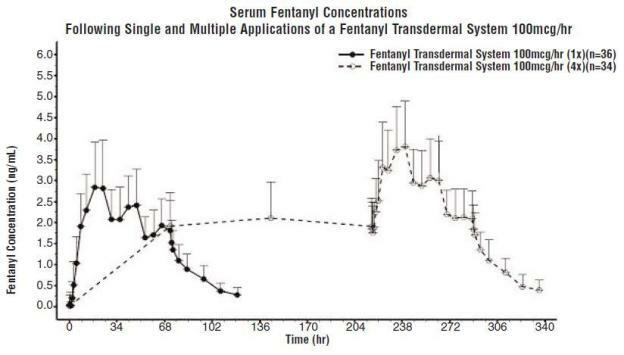 Serum fentanyl concentrations increase gradually following initial fentanyl transdermal system application, generally leveling off between 12 and 24 hours and remaining relatively constant, with some fluctuation, for the remainder of the 72-hour application period. Peak serum concentrations of fentanyl generally occurred between 20 and 72 hours after initial application (see Table A). Serum fentanyl concentrations achieved are proportional to the fentanyl transdermal system delivery rate. With continuous use, serum fentanyl concentrations continue to rise for the first two system applications. By the end of the second 72-hour application, a steady-state serum concentration is reached and is maintained during subsequent applications of a system of the same size. Patients reach and maintain a steady state serum concentration that is determined by individual variation in skin permeability and body clearance of fentanyl. NOTE:After system removal there is continued systemic absorption from residual fentanyl in the skin so that serum concentrations fall 50%, on average, in approximately 20 to 27 hours. NOTE:Information on volume of distribution and half-life not available for renally impaired patients. Data from intravenous studies with fentanyl suggest that the elderly patients may have reduced clearance and a prolonged half-life. Moreover elderly patients may be more sensitive to the active substance than younger patients. A study conducted with the fentanyl transdermal system in elderly patients demonstrated that fentanyl pharmacokinetics did not differ significantly from young adult subjects, although peak serum concentrations tended to be lower and mean half-life values were prolonged to approximately 34 hours. Fentanyl transdermal system should be used with caution in elderly, cachectic or debilitated patients as they may have altered pharmacokinetics due to poor fat stores, muscle wasting, or altered clearance (see DOSAGE AND ADMINISTRATION). The interaction between ritonavir, a CPY3A4 inhibitor, and fentanyl was investigated in eleven healthy volunteers in a randomized crossover study. Subjects received oral ritonavir or placebo for 3 days. The ritonavir dose was 200 mg tid on Day 1 and 300 mg tid on Day 2 followed by one morning dose of 300 mg on Day 3. On Day 2, fentanyl was given as a single IV dose at 5 mcg/kg two hours after the afternoon dose of oral ritonavir or placebo. Naloxone was administered to counteract the side effects of fentanyl. The results suggested that ritonavir might decrease the clearance of fentanyl by 67%, resulting in a 174% (range 52% to 420%) increase in fentanyl AUC0-âˆž. Coadministration of ritonavir in patients receiving fentanyl transdermal system has not been studied; however, an increase in fentanyl AUC is expected (see BOX WARNING, WARNINGS, PRECAUTIONS and DOSAGE AND ADMINISTRATION). Fentanyl is metabolized mainly via the human cytochrome P450 3A4 isoenzyme system (CYP3A4), therefore, potential interactions may occur when fentanyl transdermal system is given concurrently with agents that affect CYP3A4 activity. Coadministration with agents that induce CYP3A4 activity may reduce the efficacy of fentanyl transdermal system. The concomitant use of transdermal fentanyl with all CYP3A4 inhibitors (such as ritonavir, ketoconazole, itraconazole, troleandomycin, clarithromycin, nelfinavir, nefazadone, amiodarmone, amprenavir, aprepitant, diltiazem, erythromycin, fluconazole, fosamprenavir, grapefruit juice, and verapamil) may result in an increase in fentanyl plasma concentrations, which could increase or prolong adverse drug effects and may cause potentially fatal respiratory depression. Patients receiving fentanyl transdermal system and any CYP3A4 inhibitor should be carefully monitored for an extended period of time and dosage adjustments should be made if warranted (see BOX WARNING, WARNINGS, PRECAUTIONS, and DOSAGE AND ADMINISTRATION for further information). Because of the risk for serious or life-threatening hypoventilation, fentanyl transdermal system is CONTRAINDICATED in the treatment of post-operative and acute pain and in patients who are not opioid-tolerant. In clinical trials of 357 patients with acute pain treated with fentanyl transdermal system, 13 patients experienced hypoventilation. Hypoventilation was manifested by respiratory rates of less than 8 breaths/minute or a pCO2 greater than 55 mm Hg. In these studies, the incidence of hypoventilation was higher in nontolerant women (10) than in men (3) and in patients weighing less than 63 kg (9 of 13). Although patients with impaired respiration were not common in the trials, they had higher rates of hypoventilation. In addition, post-marketing reports have been received that describe opioid-naive post-operative patients who have experienced clinically significant hypoventilation and death with fentanyl transdermal system. While most adult and pediatric patients using fentanyl transdermal system chronically develop tolerance to fentanyl induced hypoventilation, episodes of slowed respirations may occur at any time during therapy. Hypoventilation can occur throughout the therapeutic range of fentanyl serum concentrations, especially for patients who have an underlying pulmonary condition or who receive usual doses of opioids or other CNS drugs associated with hypoventilation in addition to fentanyl transdermal system. The use of fentanyl transdermal system is contraindicated in patients who are not tolerant to opioid therapy. The use of fentanyl transdermal system should be monitored by clinical evaluation, especially within the initial 24 to 72 hours when serum concentrations from the initial system will peak, and following increases in dosage. Fentanyl transdermal system should be administered to children only if they are opioid-tolerant and 2 years of age or older. Fentanyl transdermal system should ONLY be used in patients who are already receiving opioid therapy, who have demonstrated opioid tolerance, and who require a total daily dose at least equivalent to fentanyl transdermal system 25 mcg/hr (see DOSAGE AND ADMINISTRATION). Patients who are considered opioid-tolerant are those who have been taking, for a week or longer, at least 60 mg of morphine daily, or at least 30 mg of oral oxycodone daily, or at least 8 mg of oral hydromorphone daily, or an equianalgesic dose of another opioid. Because serious or life-threatening hypoventilation could result, fentanyl transdermal system is contraindicated for use on an as needed basis (i.e., prn), for the management of post-operative or acute pain, or in patients who are not opioid-tolerant or who require opioid analgesia for a short period of time (see BOX WARNING and CONTRAINDICATIONS). Fentanyl transdermal system is ONLY for use in patients who are already tolerant to opioid therapy of comparable potency. Use in non-opioid tolerant patients may lead to fatal respiratory depression. Overestimating the fentanyl transdermal system dose when converting patients from another opioid medication can result in fatal overdose with the first dose. The mean half-life is approximately 20 to 27 hours. Therefore, patients who have experienced serious adverse events, including overdose, will require monitoring for at least 24 hours after fentanyl transdermal system removal since serum fentanyl concentrations decline gradually and reach an approximate 50% reduction in serum concentrations 20 to 27 hours after system removal. All patients and their caregivers should be advised to avoid exposing the fentanyl transdermal system application site and surrounding area to direct external heat sources, such as heating pads or electric blankets, heat or tanning lamps, saunas, hot tubs, and heated water beds, etc., while wearing the system. Patients should be advised against taking hot baths or sunbathing. There is a potential for temperature-dependent increases in fentanyl released from the system resulting in possible overdose and death. A clinical pharmacology trial conducted in healthy adult subjects has shown that the application of heat over fentanyl transdermal system increased mean fentanyl AUC values by 120% and mean Cmaxvalues by 61%. Death and other serious medical problems have occurred when people were accidentally exposed to fentanyl transdermal system. Examples of accidental exposure include transfer of a fentanyl transdermal system from an adultâ€™s body to a child while hugging, accidental sitting on a fentanyl transdermal system and possible accidental exposure of a caregiverâ€™s skin to the medication in the system while the caregiver was applying or removing the system. Because significant amounts of fentanyl are absorbed from the skin for 20 to 27 hours or more after the system is removed, hypoventilation may persist beyond the removal of fentanyl transdermal system. Consequently, patients with hypoventilation should be carefully observed for degree of sedation and their respiratory rate monitored until respiration has stabilized. Fentanyl transdermal system should be used with extreme caution in patients with significant chronic obstructive pulmonary disease or cor pulmonale, and in patients having a substantially decreased respiratory reserve, hypoxia, hypercapnia, or pre-existing respiratory depression. In such patients, even usual therapeutic doses of fentanyl transdermal system may decrease respiratory drive to the point of apnea. In these patients, alternative non-opioid analgesics should be considered, and opioids should be employed only under careful medical supervision at the lowest effective dose. The concomitant use of transdermal fentanyl with all CYP3A4 inhibitors (such as ritonavir, ketoconazole, itraconazole, troleandomycin, clarithromycin, nelfinavir, nefazadone, amiodarone, amprenavir, aprepitant, diltiazem, erythromycin, fluconazole, fosamprenavir, grapefruit juice, and verapamil) may result in an increase in fentanyl plasma concentrations, which could increase or prolong adverse drug effects and may cause potentially fatal respiratory depression. Patients receiving fentanyl transdermal system and any CYP3A4 inhibitor should be carefully monitored for an extended period of time, and dosage adjustments should be made if warranted (see BOX WARNING, CLINICAL PHARMACOLOGY â€“ Drug Interactions, PRECAUTIONS and DOSAGE AND ADMINISTRATION for further information). Patients, family members and caregivers should be instructed to keep systems (new and used) out of the reach of children and others for whom fentanyl transdermal system was not prescribed. A considerable amount of active fentanyl remains in fentanyl transdermal system even after use as directed. Accidental or deliberate application or ingestion by a child or adolescent will cause respiratory depression that could result in death. Physical dependence is a state of adaptation that is manifested by an opioid specific withdrawal syndrome that can be produced by abrupt cessation, rapid dose reduction, decreasing blood level of the drug, and/or administration of an antagonist. The opioid abstinence or withdrawal syndrome is characterized by some or all of the following: restlessness, lacrimation, rhinorrhea, yawning, perspiration, chills, piloerection, myalgia, mydriasis, irritability, anxiety, backache, joint pain, weakness, abdominal cramps, insomnia, nausea, anorexia, vomiting, diarrhea, or increased blood pressure, respiratory rate, or heart rate. In general, opioids should not be abruptly discontinued (see DOSAGE AND ADMINISTRATION â€“ Discontinuation of Fentanyl Transdermal System). Patients should be advised that fentanyl transdermal systems contain fentanyl, an opioid pain medicine similar to morphine, hydromorphone, methadone, oxycodone, and oxymorphone. Patients should be advised that each fentanyl transdermal system may be worn continuously for 72 hours, and that each system should be applied to a different skin site after removal of the previous transdermal system. In young children or persons with cognitive impairment, the system should be put on the upper back to lower the chances that the system will be removed and placed in the mouth. Hair at the application site should be clipped (not shaved) prior to system application. If the site of fentanyl transdermal system application must be cleansed prior to application of the system, do so with clear water. Allow the skin to dry completely prior to system application. The fentanyl transdermal system should not be used if the pouch seal is broken, or if the system is cut, damaged, or changed in any way. The transdermal system should be pressed firmly in place with the palm of the hand for 30 seconds, making sure the contact is complete, especially around the edges. The system should not be folded so that only part of the system is exposed. Patients should be advised that the dose of fentanyl transdermal system or the number of systems applied to the skin should NEVER be adjusted without the prescribing healthcare professionalâ€™s instruction. Patients should also be advised of a potential for temperature dependent increases in fentanyl release from the system that could result in an overdose of fentanyl; therefore, patients who develop a high fever or increased body temperature due to strenuous exertion while wearing the system should contact their physician. Patients should be advised that if they experience problems with adhesion of the fentanyl transdermal system, they may tape the edges of the system with first aid tape. If problems with adhesion persist, patients may overlay the system with a transparent adhesive film dressing (e.g., Bioclusiveâ„¢). Patients should be advised that if the system falls off before 72 hours a new system may be applied to a different skin site. Patients should be advised to fold (so that the adhesive side adheres to itself) and immediately flush down the toilet used fentanyl transdermal systems after removal from the skin. Patients should be advised that fentanyl transdermal system should not be combined with alcohol or other CNS depressants (e.g. sleep medications, tranquilizers) because dangerous additive effects may occur, resulting in serious injury or death. Patients should be advised that fentanyl transdermal system contains fentanyl, a drug with high potential for abuse. Patients should be informed that, if the system dislodges and accidentally sticks to the skin of another person, they should immediately take the system off, wash the exposed area with water and seek medical attention for the accidentally exposed individual. When fentanyl transdermal system is no longer needed, the unused systems should be removed from their pouches, folded so that the adhesive side of the system adheres to itself, and flushed down the toilet. In a two-year carcinogenicity study conducted in rats, fentanyl was not associated with an increased incidence of tumors at subcutaneous doses up to 33 mcg/kg/day in males or 100 mcg/kg/day in females (0.16 and 0.39 times the human daily exposure obtained via the 100 mcg/hr system based on AUC0-24h comparison). There was no evidence of mutagenicity in the Ames Salmonella mutagenicity assay, the primary rat hepatocyte unscheduled DNA synthesis assay, the BALB/c 3T3 transformation test, and the human lymphocyte and CHO chromosomal aberration in-vitro assays. The potential effects of fentanyl on male and female fertility were examined in the rat model via two separate experiments. In the male fertility study, male rats were treated with fentanyl (0, 0.025, 0.1 or 0.4 mg/kg/day) via continuous intravenous infusion for 28 days prior to mating; female rats were not treated. In the female fertility study, female rats were treated with fentanyl (0, 0.025, 0.1 or 0.4 mg/kg/day) via continuous intravenous infusion for 14 days prior to mating until day 16 of pregnancy; male rats were not treated. Analysis of fertility parameters in both studies indicated that an intravenous dose of fentanyl up to 0.4 mg/kg/day to either the male or the female alone produced no effects on fertility (this dose is approximately 1.6 times the daily human dose administered by a 100 mcg/hr system on a mg/m2 basis). In a separate study, a single daily bolus dose of fentanyl was shown to impair fertility in rats when given in intravenous doses of 0.3 times the human dose for a period of 12 days. The potential effects of fentanyl on embryo-fetal development were studied in the rat, mouse, and rabbit models. Published literature reports that administration of fentanyl (0, 10, 100, or 500 mcg/kg/day) to pregnant female Sprague-Dawley rats from day 7 to 21 via implanted microosmotic minipumps did not produce any evidence of teratogenicity (the high dose is approximately 2 times the daily human dose administered by a 100 mcg/hr system on a mg/m2 basis). In contrast, the intravenous administration of fentanyl (0, 0.01, or 0.03 mg/kg) to bred female rats from gestation day 6 to 18 suggested evidence of embryotoxicity and a slight increase in mean delivery time in the 0.03 mg/kg/day group. There was no clear evidence of teratogenicity noted. Pregnant female New Zealand White rabbits were treated with fentanyl (0, 0.025, 0.1, 0.4 mg/kg) via intravenous infusion from day 6 to day 18 of pregnancy. Fentanyl produced a slight decrease in the body weight of the live fetuses at the high dose, which may be attributed to maternal toxicity. Under the conditions of the assay, there was no evidence for fentanyl induced adverse effects on embryo-fetal development at doses up to 0.4 mg/kg (approximately 3 times the daily human dose administered by a 100 mcg/hr system on a mg/m2 basis). The potential effects of fentanyl on prenatal and postnatal development were examined in the rat model. Female Wistar rats were treated with 0, 0.025, 0.1, or 0.4 mg/kg/day fentanyl via intravenous infusion from day 6 of pregnancy through 3 weeks of lactation. Fentanyl treatment (0.4 mg/kg/day) significantly decreased body weight in male and female pups and also decreased survival in pups at day 4. Both the mid-dose and high-dose of fentanyl animals demonstrated alterations in some physical landmarks of development (delayed incisor eruption and eye opening) and transient behavioral development (decreased locomotor activity at day 28 which recovered by day 50). The mid-dose and the high-dose are 0.4 and 1.6 times the daily human dose administered by a 100 mcg/hr system on a mg/m2 basis. The safety of fentanyl transdermal system was evaluated in three open-label trials in 291 pediatric patients with chronic pain, 2 years of age through 18 years of age. Starting doses of 25 mcg/hr and higher were used by 181 patients who had been on prior daily opioid doses of at least 45 mg/day of oral morphine or an equianalgesic dose of another opioid. Initiation of fentanyl transdermal system therapy in pediatric patients taking less than 60 mg/day of oral morphine or an equianalgesic dose of another opioid has not been evaluated in controlled clinical trials. Approximately 90% of the total daily opioid requirement (fentanyl transdermal system plus rescue medication) was provided by fentanyl transdermal system. Data from intravenous studies with fentanyl suggest that the elderly patients may have reduced clearance and a prolonged half-life. Moreover elderly patients may be more sensitive to the active substance than younger patients. A study conducted with fentanyl transdermal system in elderly patients demonstrated that fentanyl pharmacokinetics did not differ significantly from young adult subjects, although peak serum concentrations tended to be lower and mean half-life values were prolonged to approximately 34 hours. In post-marketing experience, deaths from hypoventilation due to use of fentanyl transdermal system have been reported (see BOX WARNING and CONTRAINDICATIONS). Hypoventilation was the most serious adverse reaction observed in 13 (4%) postoperative patients and in 3 (2%) of the cancer patients. Hypotension and hypertension were observed in 11 (3%) and 4 (1%) of the opioid-naive patients. Adverse events reported in pediatric patients at a rate of â‰¥1% are presented in Table 1. The high content of fentanyl in the systems (fentanyl transdermal system) may be a particular target for abuse and diversion. Fentanyl transdermal systems are intended for transdermal use (to be applied on the skin) only. Do not use a fentanyl transdermal system if the pouch seal is broken or the system is cut, damaged, or changed in any way. For the management of hypoventilation, immediate countermeasures include removing the fentanyl transdermal system and physically or verbally stimulating the patient. These actions can be followed by administration of a specific narcotic antagonist such as naloxone. The duration of hypoventilation following an overdose may be longer than the effects of the narcotic antagonist's action (the half-life of naloxone ranges from 30 to 81 minutes). The interval between IV antagonist doses should be carefully chosen because of the possibility of re-narcotization after system removal; repeated administration of naloxone may be necessary. Reversal of the narcotic effect may result in acute onset of pain and the release of catecholamines. Always ensure a patient airway is established and maintained, administer oxygen and assist or control respiration as indicated and use an oropharyngeal airway or endotracheal tube if necessary. Adequate body temperature and fluid intake should be maintained. Fentanyl transdermal systems are intended for transdermal use (on intact skin) only. The fentanyl transdermal system should not be used if the pouch seal is broken or the system is cut, damaged, or changed in any way. Each fentanyl transdermal system may be worn continuously for 72 hours. The next system should be applied to a different skin site after removal of the previous transdermal system. If problems with adhesion of the fentanyl transdermal system occur, the edges of the system may be taped with first aid tape. If problems with adhesion persist, the system may be overlayed with a transparent adhesive film dressing (e.g., Bioclusiveâ„¢). If the system falls off before 72 hours, dispose of it by folding in half and flushing down the toilet. A new system may be applied to a different skin site. Fentanyl transdermal system is ONLY for use in patients who are already tolerant to opioid therapy of comparable potency. Use in non-opioid tolerant patients may lead to fatal respiratory depression. Overestimating the fentanyl transdermal system dose when converting patients from another opioid medication can result in fatal overdose with the first dose. Due to the mean half-life of approximately 20 to 27 hours of fentanyl transdermal system, patients who are thought to have had a serious adverse event, including overdose, will require monitoring and treatment for at least 24 hours. The concomitant use of fentanyl transdermal system with all cytochrome P450 3A4 inhibitors (such as ritonavir, ketoconazole, itraconazole, troleandomycin, clarithromycin, nelfinavir, nefazodone, amiodarone, amprenavir, aprepitant, diltiazem, erythromycin, fluconazole, fosamprenavir, grapefruit juice, and verapamil) may result in an increase in fentanyl plasma concentrations, which could increase or prolong adverse drug effects and may cause potentially fatal respiratory depression. Patients receiving fentanyl transdermal system and any CYP3A4 inhibitor should be carefully monitored for an extended period of time and dosage adjustments should be made if warranted (see BOX WARNING, CLINICAL PHARMACOLOGY â€“ Drug Interactions, WARNINGS, and PRECAUTIONS for further information). Pediatric patients converting to fentanyl transdermal system with a 25 mcg/hr system should be opioid-tolerant and receiving at least 60 mg of oral morphine or the equivalent per day. The dose conversion schedule described in Table C, and method of titration described below are recommended in opioid-tolerant pediatric patients over 2 years of age with chronic pain (see PRECAUTIONS â€“ Pediatric Use). Fentanyl transdermal system should be used with caution in elderly, cachectic, or debilitated patients as they may have altered pharmacokinetics due to poor fat stores, muscle wasting, or altered clearance (see CLINICAL PHARMACOLOGY â€“ Special Populations, Geriatric Use). Fentanyl transdermal system should ONLY be used in patients who are already receiving opioid therapy, who have demonstrated opioid tolerance, and who require a total daily dose at least equivalent to fentanyl transdermal system 25 mcg/hr. Patients who are considered opioid-tolerant are those who have been taking, for a week or longer, at least 60 mg of morphine daily, or at least 30 mg of oral oxycodone daily, or at least 8 mg oral hydromorphone daily, or an equianalgesic dose of another opioid. Safety of fentanyl transdermal system has not been established in children under 2 years of age. Fentanyl transdermal system should be administered to children only if they are opioid-tolerant and 2 years of age or older (see PRECAUTIONS - Pediatric Use). Fentanyl transdermal system should be applied to intact, non-irritated, and non-irradiated skin on a flat surface such as the chest, back, flank, or upper arm. In young children and persons with cognitive impairment, adhesion should be monitored and the upper back is the preferred location to minimize the potential of inappropriate system removal. Hair at the application site should be clipped (not shaved) prior to system application. If the site of fentanyl transdermal system application must be cleansed prior to application of the system, do so with clear water. Do not use soaps, oils, lotions, alcohol, or any other agents that might irritate the skin or alter its characteristics. Allow the skin to dry completely prior to system application. Fentanyl transdermal system should be applied immediately upon removal from the sealed package. Do not use if the pouch seal is broken. Do not alter the system (e.g., cut) in any way prior to application and do not use cut or damaged systems. Fentanyl transdermal system should be kept out of the reach of children. Used systems should be folded so that the adhesive side of the system adheres to itself, then the system should be flushed down the toilet immediately upon removal. Patients should dispose of any systems remaining from a prescription as soon as they are no longer needed. Unused systems should be removed from their pouches, folded so that the adhesive side of the system adheres to itself, and flushed down the toilet. Overestimating the fentanyl transdermal system dose when converting patients from another opioid medication can result in fatal overdose with the first dose. Due to the mean half-life of approximately 20 to 27 hours of fentanyl transdermal system, patients who are thought to have had a serious adverse event, including overdose, will require monitoring and treatment for at least 24 hours. There has been no systematic evaluation of fentanyl transdermal system as an initial opioid analgesic in the management of chronic pain, since most patients in the clinical trials were converted to fentanyl transdermal system from other narcotics. In addition, patients who are not opioid-tolerant have experienced hypoventilation and death during use of fentanyl transdermal system. Therefore, fentanyl transdermal system should be used only in patients who are opioid-tolerant. Table E displays the range of 24-hour oral morphine doses that are recommended for conversion to each fentanyl transdermal system dose. Use this table to find the calculated 24-hour morphine dose and the corresponding fentanyl transdermal system dose. Initiate fentanyl transdermal system treatment using the recommended dose and titrate patients upwards (no more frequently than every 3 days after the initial dose or than every 6 days thereafter) until analgesic efficacy is attained. The recommended starting dose when converting from other opioids to fentanyl transdermal system is likely too low for 50% of patients. This starting dose is recommended to minimize the potential for overdosing patients with the first dose. For delivery rates in excess of 100 mcg/hr, multiple systems may be used. 1 Table C should not be used to convert from fentanyl transdermal system to other therapies because this conversion to fentanyl transdermal system is conservative. Use of Table C for conversion to other analgesic therapies can overestimate the dose of the new agent. Overdosage of the new analgesic agent is possible (see DOSAGE AND ADMINISTRATION - Discontinuation of Fentanyl Transdermal System). 1 Table D should not be used to convert from fentanyl transdermal system to other therapies because this conversion to fentanyl transdermal system is conservative. Use of Table D for conversion to other analgesic therapies can overestimate the dose of the new agent. Overdosage of the new analgesic agent is possible (see DOSAGE AND ADMINISTRATION - Discontinuation of Fentanyl Transdermal System). c Although controlled studies are not available, in clinical practice it is customary to consider the doses of opioid given IM, IV or subcutaneously to be equivalent. There may be some differences in pharmacokinetic parameters such as Cmax and Tmax. d The conversion ratio of 10 mg parenteral morphine = 30 mg oral morphine is based on clinical experience in patients with chronic pain. The conversion ratio of 10 mg parenteral morphine = 60 mg oral morphine is based on a potency study in acute pain. Reference: Ashburn and Lipman (1993) Management of pain in the cancer patient. Anesth Analg 76:402-416.
h Numorphan® is a registered trademark of Endo Pharmaceutical, Inc.
1 Table E should not be used to convert from fentanyl transdermal system to other therapies because this conversion to fentanyl transdermal system is conservative. Use of Table E for conversion to other analgesic therapies can overestimate the dose of the new agent. Overdosage of the new analgesic agent is possible (see DOSAGE AND ADMINISTRATION - Discontinuation of Fentanyl Transdermal System). Because of the increase in serum fentanyl concentration over the first 24 hours following initial system application, the initial evaluation of the maximum analgesic effect of fentanyl transdermal system cannot be made before 24 hours of wearing. The initial fentanyl transdermal system dose may be increased after 3 days (see DOSAGE AND ADMINISTRATION - Dose Titration). Appropriate dosage increments should be based on the daily dose of supplementary opioids, using the ratio of 45 mg/24 hours of oral morphine to a 12.5 mcg/hr increase in fentanyl transdermal system dose. To convert patients to another opioid, remove fentanyl transdermal system and titrate the dose of the new analgesic based upon the patient's report of pain until adequate analgesia has been attained. Upon system removal, 17 hours or more are required for a 50% decrease in serum fentanyl concentrations. Opioid withdrawal symptoms (such as nausea, vomiting, diarrhea, anxiety, and shivering) are possible in some patients after conversion or dose adjustment. For patients requiring discontinuation of opioids, a gradual downward titration is recommended since it is not known at what dose level the opioid may be discontinued without producing the signs and symptoms of abrupt withdrawal. Tables C, D, and E should not be used to convert from fentanyl transdermal system to other therapies. Because the conversion to fentanyl transdermal system is conservative, use of Tables C, D, and E for conversion to other analgesic therapies can overestimate the dose of the new agent. Overdosage of the new analgesic agent is possible. Fentanyl transdermal system is supplied in sealed pouches which pose little risk of exposure to health care workers. Do not use a fentanyl transdermal system if the pouch seal is broken or the system is cut, damaged, or changed in any way. Store in original unopened pouch. Store up to 25°C (77°F); excursions permitted to 15 to 30°C (59 to 86°F). Apply immediately after removal from individually sealed pouch. Do not use if the pouch seal is broken. For transdermal use only. Bioclusiveâ„¢ is a trademark of Ethicon, Inc.
Keep fentanyl transdermal system in a safe place away from children and pets. Accidental use by a child or pet is a medical emergency and may result in death. If a child or pet accidentally uses fentanyl transdermal system, get emergency help right away. Make sure you read the separate â€œInstructions for Applying a Fentanyl Transdermal System.â€ Always use a fentanyl transdermal system the right way. Fentanyl transdermal system can cause serious breathing problems and death, especially if it is used the wrong way. Fentanyl transdermal system is a federally controlled substance (C-II) because it can be abused. Keep fentanyl transdermal system in a safe place to prevent theft. Selling or giving away fentanyl transdermal system may harm others, and is against the law. Tell your doctor if you (or a family member) have ever abused or been dependent on alcohol, prescription medicines or street drugs. Read the Medication Guide that comes with fentanyl transdermal system before you start using it and each time you get a new prescription. There may be new information. This Medication Guide does not take the place of talking to your healthcare provider about your medical condition or your treatment. Make sure you read and understand all the instructions for using fentanyl transdermal system. Do not use fentanyl transdermal system unless you understand everything. Talk to your healthcare provider if you have questions. What is the most important information I should know about fentanyl transdermal system? Fentanyl transdermal system is a skin patch that contains fentanyl. A fentanyl transdermal system must be used only on the skin of the person for whom it was prescribed. If the system comes off and accidentally sticks to the skin of another person, take the system off of that person right away, wash the area with water, and get medical care for them right away. Fentanyl transdermal system is not safe for everyone. Tell your doctor about all of your medical conditions. Tell your doctor if you are planning to become pregnant, are pregnant, or breastfeeding. Fentanyl transdermal system may cause serious harm to a baby. Tell your doctor about all the medicines you take. Some medicines may cause serious or life-threatening side effects when used with fentanyl transdermal system. Your doctor will tell you if it is safe to take other medicines while you are using fentanyl transdermal system. Know the medicines you take. Keep a list of your medicines to show to your doctor and pharmacist. How should I use fentanyl transdermal system? Read the separate â€œInstructions for Applying a Fentanyl Transdermal Systemâ€. Do not use a fentanyl transdermal system if the pouch seal is broken, or the system is cut, damaged, or changed in any way. Do not use heat sources such as heating pads, electric blankets, heat lamps, tanning lamps, saunas, hot tubs, or heated waterbeds while wearing a fentanyl transdermal system. Do not take hot baths or sunbathe while wearing a fentanyl transdermal system. Apply first aid tape only to the edges of the system. If problems with the system not sticking persist, cover the system with Bioclusiveâ„¢. This is a special see-through adhesive dressing. Never cover a fentanyl transdermal system with any other bandage or tape. If your fentanyl transdermal system falls off before 3 days or 72 hours, fold the sticky side together and flush down a toilet. Put a new one on at a different skin site. Do not change your dose unless your doctor tells you to. Your doctor may change your dose after seeing how the medicine affects you. Do not use fentanyl transdermal system more often than prescribed. Call your doctor if your pain is not well controlled while using fentanyl transdermal system. Do not stop using fentanyl transdermal system suddenly. Stopping fentanyl transdermal system suddenly can make you sick with withdrawal symptoms (for example, nausea, vomiting, diarrhea, anxiety, and shivering). Your body can develop a physical dependence on fentanyl transdermal system. If your doctor decides you no longer need fentanyl transdermal system, ask how to slowly reduce this medicine so you donâ€™t have withdrawal symptoms. Do not stop taking fentanyl transdermal system without talking to your doctor. Do not wear more than one fentanyl transdermal system at a time, unless your doctor tells you to do so. A fever or increase in body temperature may cause too much of the medicine in fentanyl transdermal system to pass into your body. If you use more fentanyl transdermal system than your doctor has prescribed, get emergency medical help right away. Do not drink any alcohol while using fentanyl transdermal system. Alcohol can increase your chances of having serious side effects. Do not drive, operate heavy machinery, or do other possibly dangerous activities until you know how fentanyl transdermal system affects you. Fentanyl transdermal system can make you sleepy. Ask your doctor to tell you when it is okay to do these activities. When you remove your fentanyl transdermal system, fold the sticky sides of a used fentanyl transdermal system together and flush it down the toilet. Do not put used fentanyl transdermal systems in a trash can. What are the possible side effects of fentanyl transdermal system? Low blood pressure. This can make you feel dizzy if you get up too fast from sitting or lying down. The common side effects with fentanyl transdermal system are nausea, vomiting, constipation, dry mouth, sleepiness, confusion, weakness, sweating, and pain and redness where the system was applied. Constipation is a very common side effect of all opioid medicines. Talk to your health practitioner about the use of laxatives and stool softeners to prevent or treat constipation while taking fentanyl transdermal system. Talk to your health practitioner about any side effect that concerns you. These are not all the possible side effects of fentanyl transdermal system. For a complete list, ask your doctor or pharmacist. How should I store fentanyl transdermal system? Store in original unopened pouch up to 25°C (77°F). Keep a fentanyl transdermal system in its protective pouch until you are ready to use it. Keep fentanyl transdermal system in a safe place out of the reach of children and pets. Dispose of fentanyl transdermal systems you no longer need. Open the unused packages, fold the sticky sides of the systems together, and flush them down the toilet. Do not use fentanyl transdermal system for a condition for which it was not prescribed. Do not give fentanyl transdermal system to other people, even if they have the same symptoms you have. Fentanyl transdermal system can harm other people and even cause death. Sharing fentanyl transdermal system is against the law. This Medication Guide summarizes the most important information about fentanyl transdermal system. If you would like more information, talk with your doctor. You can ask your doctor or pharmacist for information about fentanyl transdermal system that is written for doctors. For questions about fentanyl transdermal system, please call Apotex Corp. at 1-888-333-6127, 9 A.M. to 5 P.M. Eastern Time, Monday through Friday. If this is a medical emergency, please call 911. What are the ingredients of fentanyl transdermal system? Inactive Ingredients: Polyisobutylene, Mineral Oil, Isopropyl Myristate, Polyester Films. This Medication Guide has been approved by the United States Food and Drug Administration. Do not use a fentanyl transdermal system if the seal on the pouch is broken or the patch is cut, damaged or changed in any way. Fentanyl transdermal systems are available in 4 different doses and patch sizes. Make sure you have the right dose patch or patches that have been prescribed for you. Choose the time of day that is best for you to apply fentanyl transdermal system. Change it at about the same time of day (3 days or 72 hours after you apply the patch) or as directed by your doctor. Do not wear more than one fentanyl transdermal system at a time unless your doctor tells you to do so. Before putting on a new fentanyl transdermal system, remove the patch you have been wearing. 3. Open the Pouch: Fold and tear at slit, or cut at slit taking care so as not to cut the patch, and remove the fentanyl transdermal system. Each fentanyl transdermal system is sealed in its own protective pouch. Do not remove the fentanyl transdermal system from the pouch until you are ready to use it (see Figure 6). 4. Peel: Peel off the protective liner from the patch. Each fentanyl transdermal system has a clear plastic backing that can be peeled off. This covers the sticky side of the patch. Carefully peel this backing off. Throw the clear plastic backing away. Touch the sticky side of a fentanyl transdermal system as little as possible (see Figure 7). Fentanyl transdermal system may not stick to all patients. You need to check the patches often to make sure that they are sticking well to the skin. If the patch falls off right away after applying, throw it away and put a new one on at a different skin site (see â€œDisposing a Fentanyl Transdermal Systemâ€). If you continue to have problems with the patch sticking, you may cover the patch with Bioclusiveâ„¢. This is a special see-through adhesive dressing. Never cover a fentanyl transdermal system with any other bandage or tape. Remove the backing from the Bioclusiveâ„¢ dressing and place it carefully over the fentanyl transdermal system, smoothing it over the patch and your skin. If your patch falls off later, but before 3 days (72 hours) of use, discard it properly (see â€œDisposing a Fentanyl Transdermal Systemâ€) and put a new one on at a different skin site. Be sure to let your doctor know that this has happened, and do not replace the new patch until 3 days (72 hours) after you put it on (or as directed by your doctor). 7. Remove a fentanyl transdermal system after wearing it for 3 days (72 hours) (see â€œDisposing a Fentanyl Transdermal Systemâ€). Choose a different place on the skin to apply a new fentanyl transdermal system and repeat Steps 2 through 6. Do not apply the new patch to the same place as the last one. You can bathe, swim or shower while you are wearing a fentanyl transdermal system. If the patch falls off before 3 days (72 hours) after application, discard it properly (see â€œDisposing a Fentanyl Transdermal Systemâ€) and put a new one on at a different skin site. Be sure to let your doctor know that this has happened, and do not replace the new patch until 3 days (72 hours) after you put it on (or as directed by your doctor). Fold the used fentanyl transdermal system in half so that the sticky side sticks to itself (Figure 9). Flush the used fentanyl transdermal system down the toilet right away (Figure 10). Throw away any fentanyl transdermal systems that are left over from your prescription as soon as they are no longer needed. Remove the leftover patches from their protective pouch and remove the protective liner. Fold the patches in half with the sticky sides together, and flush the patches down the toilet. Do not flush the pouch or the protective liner down the toilet. These items can be thrown away in a trashcan. to 15 to 30°C (59 to 86°F). Friday. If this is a medical emergency, please call 911.